Photography, paste ups, graffiti. 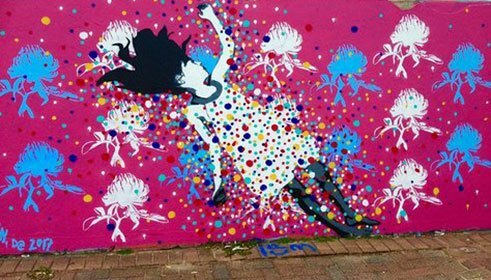 For about five years, street artist Mandy Schöne-Salter has brought colour to walls in Germany and Australia. Mandy came to Australia for love 15 years ago and has since taken residence in the Blue Mountains with her family. She is an active member of the German and Australian street art scene. 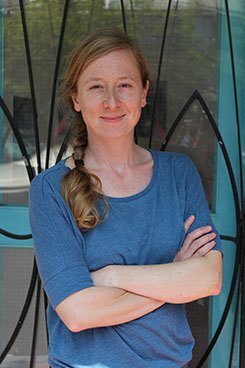 Apart from creating street art – amongst her works are an advertising column in Nuremberg and a mural for the Avalon Art Carnival –, Mandy also conducts street art workshops in both countries. For her latest project, she will be touring Western New South Wales (NSW) to design a wall for the Broken Hill Arts Exchange. “Every once in a while, I really miss Germany. So it means a lot to me to work on projects over there, too, and maintain those ties,” Mandy says. Her pseudonym MAN.DE, which she has used since 2013, is a nod to this desire for a continuing connection with Germany. “I wanted to have a name that says Mandy but also creates a visual association with Germany,” she states with a mischievous smile. The German-Australian Street Art Artist Mandy Schöne-Salter (2015) | © Sabine Scholz-Hinton Mandy is deeply involved in each of the art forms she practices. “Photography was the first medium I worked with and it will therefore always influence my work. I also love the impermanence of paste-ups. They are particularly well suited to the urban context and the quick changes you get in cities. I find murals more challenging because more elements feed into them,” she explains. 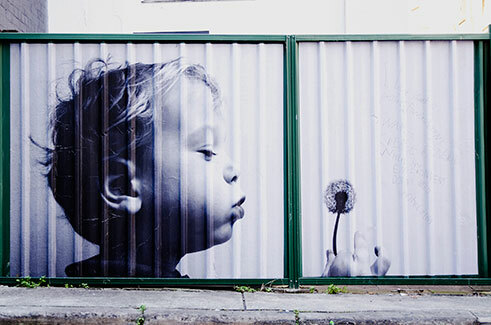 In addition to knowing how to handle a spray can, Mandy also uses her photographic talent to shape the urban space. Mandy’s own path into the street art scene was hard work. It’s difficult for women to be taken seriously. 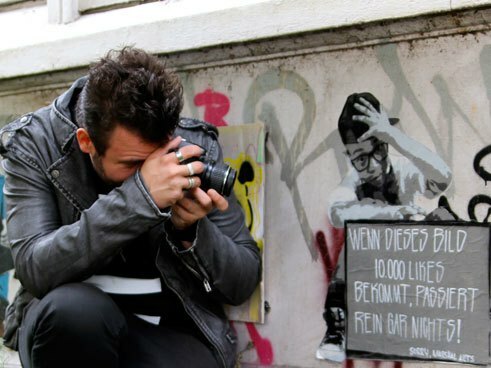 Street art expert and art historian Sebastian Hartmann, who has extensively researched urban art for many years, agrees: “My guess is that it’s the same as in fine art: The field is dominated by men but more and more women are establishing their position.” A trend that is worthy of support and will bring more diversity to the urban space. The German Art historian and Street Art expert Sebastian Hartmann | © Sebastian Hartmann In some ways, Mandy’s art is representative of her own life. As a successful female street artist, she often needed to deal with uncomfortable situations without losing faith in her own abilities. It is therefore not surprising that a major theme of Mandy’s work is giving a voice to those who need it most. Many of Mandy’s works depict children in all kinds of playful situations. According to Hartmann, female artists typically use children as motifs to transport stories and messages. 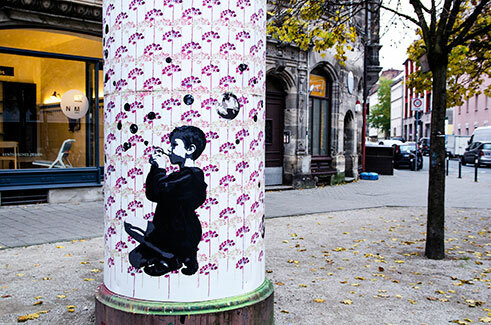 “It seems to me that street art by female artists is often done with great attention to detail – in technique as well as in content,” Hartmann explains. Mandy also says that each of her murals has a message. Her work Alice in Dream Land at Bondi Beach in Sydney, for example, shows the fantasy world children delve into when they play. They forget the real world around them and explore their environment with completely different eyes: “It’s important that young people can immerse themselves in a world where adults don’t make the rules and they can make decisions freely,” Mandy believes. 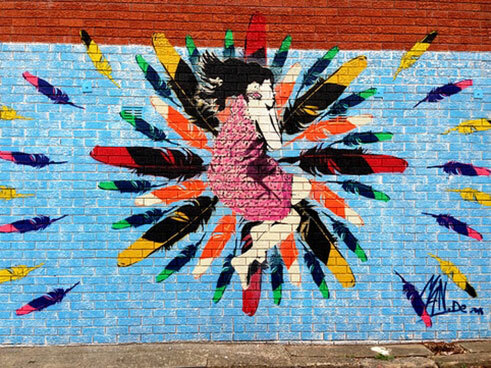 Not satisfied with just creating street art, Mandy also conducts street art workshops and participates in community arts projects, giving children and adolescents a glimpse into urban art and the various facets of street art, such as paste-ups or stencils. Mandy believes it’s important that young people are familiar with more than just tagging. The large, colourful lettering is all many of them think of when they think of street art. Yet there are so many more artistic ways to express yourself, Mandy emphasises, and she teaches teenagers these techniques in her workshops, kindling their creativity at the same time: “For me, there is no right or wrong in art, everyone is free to follow their own voice and develop their own individual style.” Mandy communicates this credo in her work as well, proving she is not just a creator and artist but also an exceptional individual who follows her own voice while giving a voice to others. 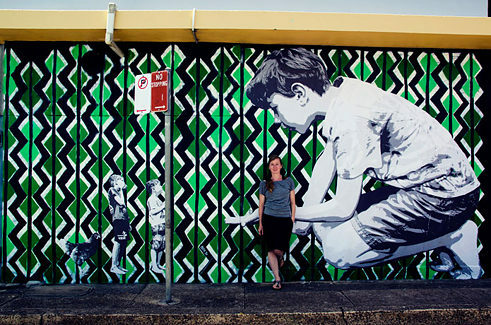 If you would like to see Mandy’s street art for yourself, you can find many of her works in Melbourne and Sydney. There’s also a temporary mural next to the Katoomba Kiosk Artist Studios. Linda Hügel was an intern at the Goethe-Institut Australien’s Internet department in Sydney. She is studying to become a Web-Editor at the University of Applied Sciences in Cologne.